I am sitting here listening to the new Muse Album: The 2nd Law. My review… very interesting. For me, it’s not as good as Absolution or Origin of Symmetry but it’s up there with The Resistance. Muse do dubstep towards the end of the album which I also find intriguing! The only track which properly put me off my work so far is “Liquid State” which adds a new memorable foot tapping riff to the classic Muse repertoire. There you go a blog on Clean Technology with a little musical review included. What more could you want on a Tuesday afternoon? I am currently preparing to talk at Anglia Ruskin University tomorrow night as a Clean Tech Entrepreneur! So is HexCam Clean Tech? Let’s define Clean Tech first: The term is used to describe products or services that improve operational performance, productivity or efficiency while reducing costs, inputs, energy consumption, waste or environmental pollution. Got it? On we go. HexCam produce a product; aerial photography and video, which I suppose could also be classed as a service. Traditionally this required the use of an aeroplane or helicopter. At its simplest level it could be achieved with a mast camera, cherry-picker or step ladder! A new generation of unmanned aerial vehicles (UAVs) has emerged that are now capable of giving manned aircraft a run for their money with regards to the quality of the product produced. This has become possible due to the combined developments in battery, camera and electronic systems that have occurred over the last few years. At HexCam, compared to traditional aerial photography solutions, we can offer reduced cost, increased efficiency, reduced energy consumption and reduced environmental pollution. Let’s look at environmental pollution first: A little graph for you! Our hexacopter (Hex) produces the equivalent of 0.24 Kg of carbon dioxide per hour of flight through battery charging. The octocopter produces 0.42 Kg. So to produce the same amount of CO2 as the classic aerial photography helicopter, the Bell 407, does in an hour I’d have to fly the octo for over 800 hours! 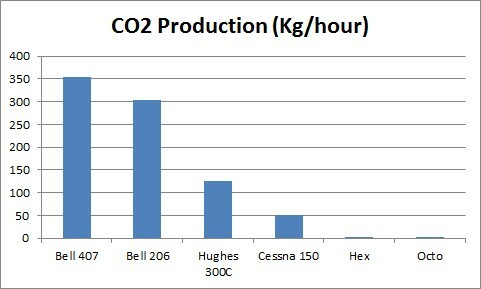 That doesn’t begin to take into account the life of product CO2 of a helicopter compared to our machines, or storage, support staff and so on. As a result of this we can bring aerial photography and video down to a reasonable cost. We can also work more efficiently. If using a helicopter or plan, it is unlikely they will be able to land at your site. So, once they have finished photographing they have to return to base, land and get the images to you over the internet or on disc. What happens if the images aren’t as you require? HexCam, on the other hand, can land onsite, immediately put our images onto a laptop for you to review. If the images aren’t as you require, we can take off and try again. If you don’t want edited photos or video, we can provide them immediately after we have taken the photos. So, I would say, yes we are Clean Tech as well as enjoying the odd music review!